CCI Swamp People Mini-Mag 22 Long Rifle Ammo 36 Grain Plated Lead Hollow Point for sale online at cheap discount prices with free shipping available on bulk 22 Long Rifle ammunition only at our online store TargetSportsUSA.com. Target Sports USA carries the entire line of CCI Blazer ammunition for sale online with free shipping on bulk ammo including this CCI Swamp People Mini-Mag 22 Long Rifle Ammo 36 Grain Plated Lead Hollow Point. CCI Swamp People Mini-Mag 22 Long Rifle Ammo 36 Grain Plated Lead Hollow Point review offers the following information; "CHOOT EM!" with this Troy Landry Special Edition CCI Mini-Mag ammunition! CCI is renowned worldwide for having dependable and consistent ammunition that delivers outstanding performance every time. That is why it is the choice for the Swamp People, Troy and Jacob Landry, when they are hunting gators in Louisiana. The CCI 36 grain Mini-Mag ammo is one of the most popular 22 Long Rifle cartridges ever created. It is the ideal load for hunters looking for practice at the range or spending an afternoon chasing small game and varmints. CCI Mini-Mag 22 Long Rifle ammunition features clean-burning powder. The clean powder provides excellent velocity while maintaining consistent chamber pressures. The powder also keeps the firearm clean, helping to ensure the rifle will function even in the harshest situations so you always get the best shot. 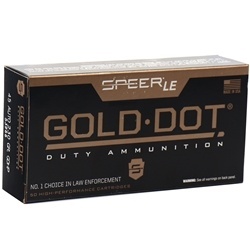 The 36 grain copper plated hollow point bullet provides reliable feeding and deep penetration. Pesky varmints will not stand a chance with this powerful and accurate CCI Mini-Mag 22 Long Rifle ammunition, guaranteed by Troy Landry! CCI Swamp People Mini-Mag 22 Long Rifle is non-corrosive, new production ammunition in brass cases with CCI sure-fire priming technology. CCI Swamp People Mini-Mag 22 Long Rifle is packaged in boxes of 300 rounds or cases of 3000 rounds. Purchase a case of CCI Mini-Mag 22 Long Rifle, receive free shipping from Target Sports USA! 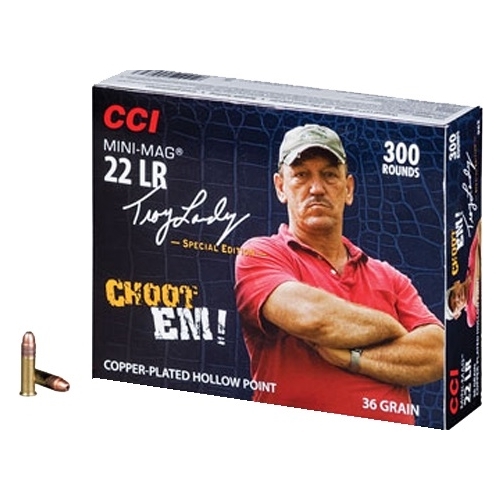 Hunt with this CCI Mini-Mag 22 Long Rifle ammo backed by "Swamp People" star, Troy Landry. CCI Mini-Mag ammunition is one of the most popular 22 Long Rifle cartridges ever made. Perfect load for shooters looking for a great day at the range or an afternoon hunting small game. Great ammo. Use in a Ruger SR22 which only feeds certain hi velocity ammo without a problem. Have never had a failure to feed with this. This is the only ammo I use for my SR22. I love CCI 22LR ammo I have been buying CCI since the early 70's for my 22's and this 22 mini mag ships better in this box of 300 then the plastic box's of 100 rds now that's one thing CCI could do better is make a better plastic box. love this ammo.